KLAMATH FALLS, Ore. - The water is beginning to flow again in some Bureau of Reclamation irrigation canals in the Klamath Basin. Some of the irrigation water that was cut off earlier in the spring is now available, thanks to a cooler-than-normal spring. 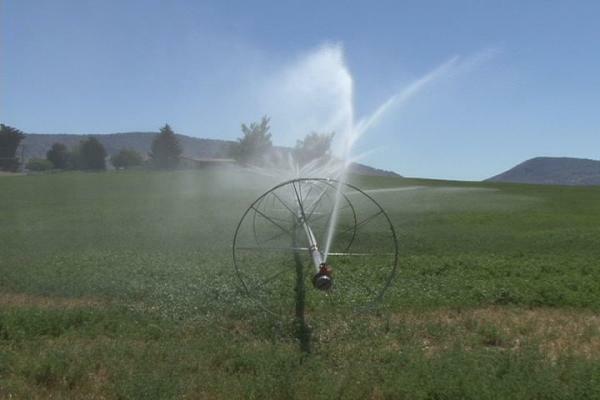 Thousands of customers in the Enterprise Irrigation District in South Suburban Klamath Falls who didn't expect to get water at all this summer are seeing some. "That's exactly how we're looking at it. The water we can get now is better than what we had yesterday. So, we're looking at it as an opportunity to give people as much water as possible. Get the lawns green, get the field going again, and hopefully help out as much as possible," said Greg Addington with the Klamath Water Users Association. About 5,500 acres will now be receiving irrigation water this summer. That ranges from large fields of alfalfa or pasture, to some suburban lawns and gardens. "We'll get some people who haven't got any water up to this point. And that's a good thing. If we can take some relief on some of the ground water wells on the aquifer, use some more surface water as opposed to ground water, that's gonna help," Addington said. Addington says many potato farmers had to move their operations to keep their contracts with commercial customers. Some went as far as Burney, California to plant their crops when it appeared there would not be enough water available through the Klamath Reclamation Project. Because of the way the allocation is set up with the Enterprise Irrigation District, most customers won't receive any water until July 19. For now, however, those who are receiving water are using what they can to try to restore crops that have been slowly drying up. On Friday, the Klamath County School Board voted to spend the money necessary to drill a new well for Lost River High School near Malin. Falling ground water levels left the pump high and dry last week, and a new, deeper well is planned to serve the school. A combination of drought and Endangered Species Act demands for protected salmon and sucker fish had forced steep cutbacks in the KRP, which serves more than 1,000 farms.